I think Derek McGrath must have had a barnstorming interview. And you know what? That’s great! I hope he went in and wowed the interview panel with a stunning vision for the future of Waterford hurling. A panel of selectors with a judicious combination of learned wisdom and disruptive genius. Fitness coaches and physios capable of keeping the panel in tip-top condition and able to peak at just the right time. Sensible ideas for blending the undoubted talent at underage level…into the Senior panel. Peter Queally was good. Derek McGrath was better. I was surprised how nervous I was in the build-up to the game. Part of that was a sickening premonition that a defeat here would lead of to all manner of eyebrow raising and sly winks from the usual suspects about how they knew Waterford wouldn’t be able to cope with pressure of Championship hurling and you can’t bayte tradition. As it happens, the game was a positive indicator that the League was not a flash in the pan. It was a repeat of the Tipperary game to see Waterford calmly reel their opponents in after giving them a decent head start and it was a repeat of the Cork game to hold them at bay in the second half while they flailed away at us in the fashion of Scrappy Doo demanding we lemme at em. There was also the bonus of Waterford hitting a team with a couple of quick-fire goals, and top-notch goals they were too. It would have been seen as a potential weakness in Waterford’s arsenal so it will give a few of the more considered eyebrow raisers something to consider to see Waterford deploy that particular weapon. Cork were flattered by the ten-point margin of defeat in the League final. To put in so much better a shift in the Munster match and only get to the stage where they were flattered by a four-point margin of defeat augers well for the future for Waterford. It is to that future that we can now look, and to do so we must first look at the past and the paragraph at the top of this post. Speaking positively about the rationale for appointing Derek McGrath didn’t amount to much more than an elaborate way of saying ‘give the guy a chance’ but events seem to have proven the hypothesis to be correct. I had said in a prior post that McGrath would have access to the services of Conor McCarthy, the physio of the Irish boxing team, as productive a conveyor belt of talent as exists in Irish sport outside of County Kilkenny. This was questioned on boards.ie, but I saw Conor on the sideline in Thurles – this was an improvement on the last time I saw him in a GAA context, after the Battle of Tramore – and a few days later I got the chance to congratulate him on his efforts. His demeanor was exhilarating in its matter-of-factness. Job done in the League, now on to the next one. I joked that McGrath must be very single-minded. There wasn’t a flicker of reaction to this. EVERYONE was focused on the next one, he said. Everyone was definitely in block capitals. Now, you can dismiss this as a load of hokum if you wish. Mind games might not survive the matter games of some of the teams lying in wait. Conor grew up in the same milieu for Waterford hurling as I did though, one where defeatism was in the stony grey soil. Here was a prepared mind, and we all know how chance views the prepared mind. Having felt surprise at the tension that coursed through me before the Cork game, there can be no surprise at any tension in advance of the Munster final. We are not in bonus territory. We are in it to win it. This entry was posted in Hurling, Waterford and tagged Cork, Derek McGrath, Munster on 10/06/2015 by deiseach. The media watcher in me has always enjoyed the frequent dummy-spitting that takes place in the media over the increasing tendency of GAA managers to wait as long as possible to name their team for upcoming games. Every so often you’ll read a variation on the theme about how managers were treating their public with contempt and negatively contrasting their behaviour with the open and sunny nature of their rugby counterparts. Not once would such an article be troubled by any introspection on how the public enjoy seeing the media treated with contempt or how the rugger buggers are happy to plámás the media in their goal to sell every more cans of Heineken. These articles reek of self-pity and are all the more entertaining because of this. For all of that, it is annoying how managers play their cards so close to their chest. The match day programme feels like an exercise in guesswork and you regularly have to take an axe to the published lineup before throw-in. It gets all the more frustrating when you consider how pointless it all feels. Do managers really think that waiting until the last minute to announce a team makes a jot of difference to the outcome? Like the policy of team rotation used in English soccer it is used by managers as a symbol that they are a serious outfit rather than the cause. Southampton, positioned in a place where they are unlikely to get to Europe via the league and even less likely to get relegated, chopped and changed their team at the weekend and were duly sunk by a team ten places below them in the table. It’s as if Mauricio Pochettino believed that if he didn’t rotate his squad then no one would see the Saints as playaz. So it was nice to see Derek McGrath eschew such nonsense by naming his team for the Tipperary game well in advance. No mind games, no acting the maggot. Just get the team on the pitch and let them do the talking there. For all of that, the speed with which Waterford announced that there would be no change in personnel for the upcoming game against Galway is slightly unnerving. We’re meant to be living in an era of number-crunching and exhaustive study of match videos to determine player performance, yet there’s no way that could have happened here. It becomes particularly odd when you consider that they must have known that Maurice Shanahan would be a doubt, yet they still went ahead and announced the team anyway. The management team seems to have decided before playing Tipperary that they would give this team two games whatever happened. That’s a strategy that is going to muddy the waters whatever happens against Galway. 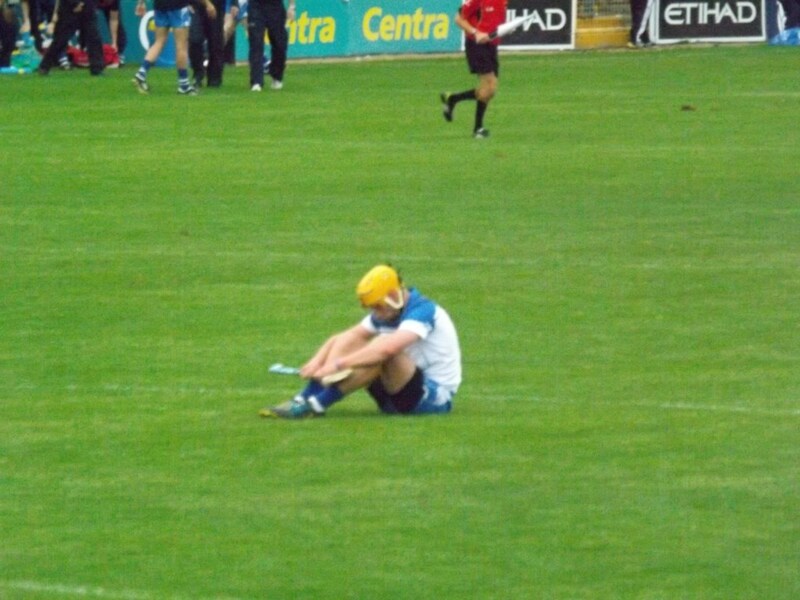 Win, and how can you change a winning formula for the Dublin game. Lose, and you’ve taken two games to decide that the current plan isn’t working. Having confidence in your plan is all very well, but no plan of battle survives contact with the enemy, and that seems to have happened for the forwards against Tipp. The injury to Shanahan makes this all moot (read: most of this was written before news of his injury was revealed). Things will have to change for Galway and we’ll be able to decide whether things were better or worse for those changes. It’s unlikely the attitude will have changed though. Let’s hope they’ve hit on the right formula, because if they haven’t it’ll all be over before anyone can do anything about it. 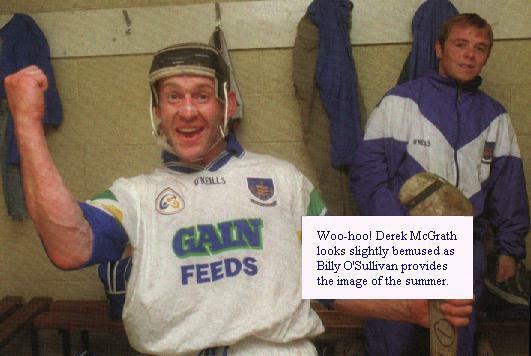 This entry was posted in Hurling, Waterford and tagged Derek McGrath on 18/02/2014 by deiseach. Having often wondered whether I had missed a trick in not pursuing a career in journalism more aggressively, and harbouring an ongoing interest in the goings-on inside the Fourth Estate, imagine my delight upon discovering that one of my new work colleagues had been a correspondent for a proper national newspaper. Finally cornering them at a post-work session – all hail Lunchtime O’Booze – I eagerly set about mining them for information on the life I might have missed. By the time we were finished, any lingering ambitions had been buried under an avalanche of reality. I knew the life of a hack was a hard and often lonely one, but I was shocked to discover just how hard it was. I blame Lou Grant. Having watched the titular TV show, I had this image of the journalistic life as centring on a newsroom, all chattering telex machines, legs propped up on desks, and shouting into phones. It was from this hive of activity that reporters would be dispatched to uncover juicy scandals for a grateful readership. Sure, most of the work would involve the grind of court reports and celebrity christenings – Lou Grant et al would be stuck doing bar mitzvahs – but ultimately the news would come to you. All you had to do was make it readable. In retrospect, I hadn’t a clue. Where did I think ‘the newsroom’ was getting the stories, from the news fairy? My new colleague made it clear to me that it was the reporter who got the story, and the only way to get the story was to continually plámás everyone who might conceivably be able to provide them with the scoop when it happened. Woe betide the hack who missed a story because the source was cosier with Phil Space than to Philippa Column. A hard life. Way too hard for a 9-5 wannabe like me. The reason I mention all this is to explain the air of confidence with which Jackie Cahill pronounced that Derek McGrath might be about to stage a spectacular come-from-behind victory over Peter Queally in the quest to become the new Waterford hurling manager. The gushing nature of the article does not suggest that it came from McGrath and/or his camp, but from someone on the interview panel who liked the cut of McGrath’s jib. And thus it has come to pass. Who says you can’t believe everything you read in newspapers? What to make of it all? I would have gone for Queally. It’s all very well saying that you shouldn’t put too much weight on recent events when deciding who is best qualified to be manager. Had De La Salle gotten a late winner and avoided an extra-time defeat to Ballygunner, it might be Derek McGrath who is the coach of the county champions rather than Peter Queally. But the fact is that that didn’t happen. Just as we judge politicians on Harold McMillan’s Macmillan’s famous events and how they react to them, surely we should judging coaches on their results rather than what might have been. On the face of it, De La Salle have regressed in the last couple of years, and here we are replacing the man who presided over the more illustrious DLS era with the man who presided over the regression. Factor in how Queally’s failure with the Under-21’s has looked better with time – no-one gave Clare a bigger rattle than we did – and my take on it is that the County Board have made the wrong choice. That’s my take anyway. I don’t have access to all the facts and, après Jackie Cahill’s column, it would be fair to assume that Derek McGrath went in for the interview and, to use a metaphor appropriate to this time of the sporting year, knocked it out of the ball park. There’s a lot of approving chatter on Twitter about the quality of the out-of-county choices in William Maher and Frank Flannery, and I can even give a little bit of insight into the new physio, Conor McCarthy (Jackie Cahill didn’t get everything right). He was the physio to the Irish Olympic boxing team last summer which is a pretty good thing to have on your CV (Update: might not be that Conor McCarthy – one to watch). Then there’s Dan. If Dan were the coach I’d be in hysterics right now, but he’s a selector where his penchant for (ahem) straight talking should be an asset. So there is much to be optimistic about going forward. It’s certainly been a bold choice, not going for the ‘obvious’ candidate. Not that it’s setting the bar very high, but let’s hope they know more about it than I do. This entry was posted in Hurling, Waterford and tagged Derek McGrath on 26/10/2013 by deiseach. The current standoff in the United States is a source of angst to anyone who doesn’t want to see the world’s wealthiest country implode, not least among them being the President and his supporters. However, the law of perverse consequences means that there is some good news for the Democrats. With the fallout from the clash dominating the headlines, teething problems for the health care reforms known as Obamacare are not getting the attention from the enemies of the reforms (i.e. the people causing the shutdown) that they might otherwise have done. The shutdown is effectively providing a smokescreen under which the law that the shutdown is being staged to prevent can be implemented successfully. The irony is delicious. Here in Waterford, we should be grateful for the ongoing back-slapping operation created by the thunderous finish in the All-Ireland final replay to what was already the most thrilling season of hurling that I, or anyone else of my acquaintance, can remember. You know something special has happened when even Fleet Street newspapers like the Guardian are piling on the love. Hopefully by the time the fuss has died down, we’ll have papered over the cracks exposed by the need to search for a new manager. For what an embarrassment it has been. Four names emerged from the process, none of them likely to inspire either the supporters or the players who took such exception to Michael Ryan. We can say this much with certainty about the attitude of the players towards one of those names because he was Michael Ryan. While my sympathies lay with him throughout this, it’s a relief that he has withdrawn his name. No manager can hope to function when the whole world knows the players have no confidence in him, so while you can understand his stubbornness in carrying on it was never a starter. Then we had DJ Carey. A truly great hurler, enough to get a fawning article about him printed in the Observer back in the day (and speaking of embarrassment, the less said about the writer of the article, the better). But what has DJ done as a manager to deserve being fast-tracked to inter-county management? Little enough that even he wasn’t interested. So names were being bandied about of people who didn’t even want the job in the first place. As I said at the top, thank God this wasn’t all happening during the hurling silly season. As of today, this leaves Peter Queally and Derek McGrath. They’re both solid choices with lots of coaching miles on the clock and, all other things being equal, being from Waterford is an advantage. But both are coming off the back of frustrating defeats – Queally for the Under-21’s, a defeat that felt like a missed opportunity even before Clare romped to Munster and All-Ireland glory, and McGrath seeing his De La Salle team fall to Ballygunner when everyone was already marking them down as county champions. Neither of these defeats fatally undermines the case for them. It means that neither makes a decisive case for their appointment either. Passage winning the county title might tip the scales in Queally’s favour, but that’s a huge ask. The County Board have insisted they are not limiting themselves to those two candidates. We should hope this is the case, if only so it doesn’t look like McGrath/Queally won the role thanks to the toss of a coin. One of the lessons that must be learned from the current pickle is that the business of ‘consulting’ squads on the status of the manager is a fudge. The players effectively have a veto over who the manager is. Spare us any flannel about how they never said they were unwilling to play under Michael Ryan. You can’t seriously ask a group of people for their opinion then behave as if that expressed opinion is enough in itself. Maybe it is a good thing to consult the players. There’s something to be said for getting any grievances out in the open rather than letting them fester. The problem is that the players don’t have to deal with the consequences of their actions. You can see people already lining up to lambast the County Board over the new manager even though they weren’t the ones who brought us to this situation. It’s not something I like, but if we are going to insist on this consultation then we should formalise the players veto. At the end of a manager’s term, whether that be two or three years, the players get the chance to express no confidence in the incumbent. This way, they have their fingerprints all over the decision rather than being able to vote no confidence while at the same time claiming that they weren’t really dissing the current manager. It might soften the players cough if they realised that they are owning their decision in the eyes of the public. And who knows? They might be really good at making these calls and we’re all better off as a result. At least we’d be able to assess this with a proper sample size rather than lurching from one crisis to the next, never heeding the warnings from history. Isn’t that right, Mr Obama? This entry was posted in GAA, Hurling, Waterford and tagged Derek McGrath, Michael Ryan on 04/10/2013 by deiseach.